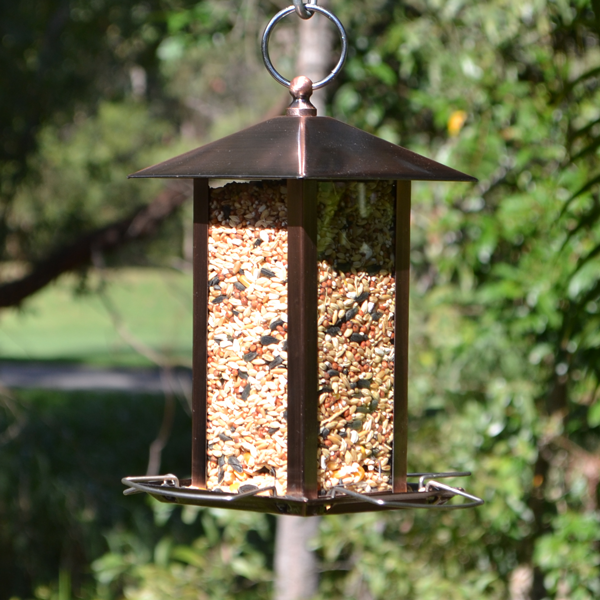 Which type of bird feeder is right for you? What types of birds are seen in my garden and perhaps, what others, might I be trying to attract? What types of food am I looking to offer? Specific types of seeds, mixes, fruit or suet? Where do I want to fix my bird feeder? Hang it from a branch, fix it to a window, or place it closer to the ground? 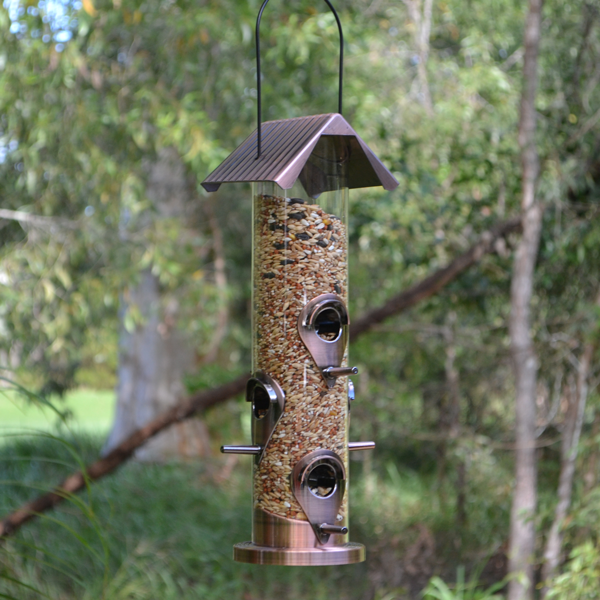 We at Nature Mates, will try to provide some information on the different types of bird feeders available and offer some insight into what types of Australian birds tend to utilise each feeder. 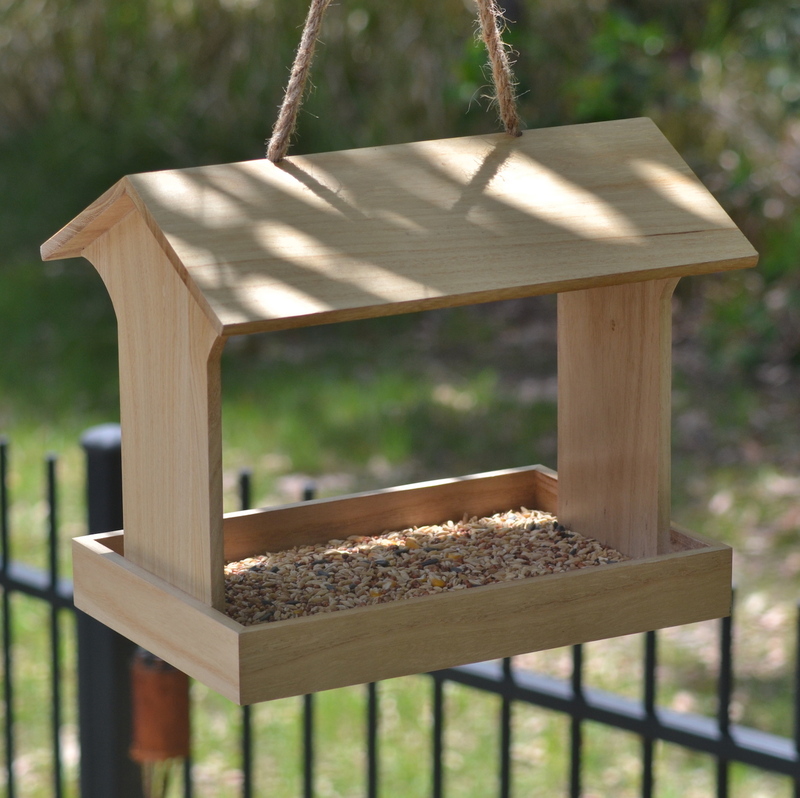 Hopefully, this will give you some guidance on selecting which bird feeder is right for you. Generally, hopper feeders tend to be the most popular type of bird feeders. It’s usually the type that comes to people’s mind as it’s usually the one that most hobbyists begin with. Hopper feeders are designed mostly, to offer seed and dispense the seed on-demand on to a bottom tray where birds can perch and feed from. A lot of hopper feeders have clear sides so you can see the level of seed remaining in the feeder and know when it needs refilling. Some hopper feeders , like some of those offered by Nature Mates, can also include mesh sides or tubes that are large enough for birds to grip on and feed on the seed through. Some hopper feeders have small perches, ensuring that the smaller birds such as sparrows and finches get the run of the hopper and make it difficult for the larger birds to perch. The type of hopper chosen, usually depends on the types of seeds you’re offering and the types of birds you most want to attract. Offering your smaller seeds may assist the smaller species when feeding, whilst offering the larger seeds, such as sunflowers, would be attractive to the lorikeets and parrots for example. Hopper feeders tend to get a lot of mess below them from falling seeds and shells which dove and pigeon species, as well as brush-turkeys love. Nature Mates’ hopper feeders are generally easy to fill and clean. Always ensure that your feeder stays clean and that the food is changed often as seeds can become mouldy, especially in the wet months. Some tube feeders available, come fixed with more than one tube and so different varieties of bird seed can be offered to attracted a range of species. Most tube feeders are designed to keep bird seed dry from rain and so prevent mould or spores. Be sure to keep your feeder clean though and change seed if it sits for too long, especially as the lowest port of the feeder is usually sits a few centimetres from the bottom of the tube, meaning a small amount of seed is always left over and can cultivate bacteria. 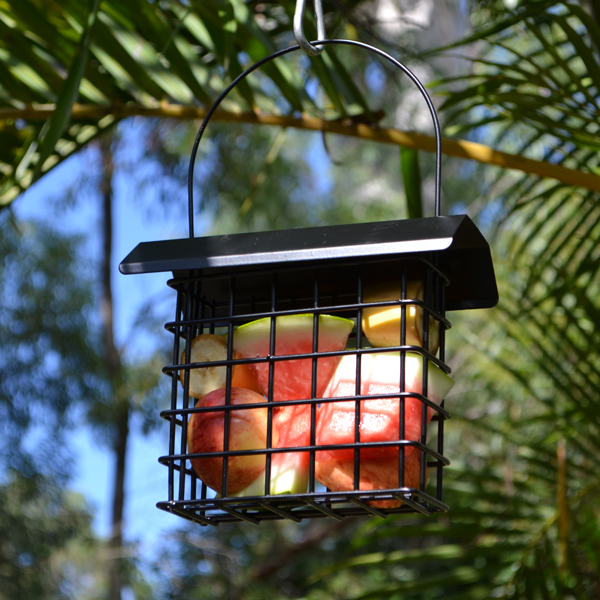 Fruit can be offered in many ways to your backyard birds. Sometimes on a tray or a spike or simply wedged into a tree. But typical suet feeders offer a nice way to serve up fresh fruit to your birds and so Nature Mates have included them together for the sake of distinguishing feeder styles. Suet feeders generally ‘cage’ the suet or fruit. Suet cake or block, or fruit pieces are placed inside the steel cage and allow birds to hang and feed without making too much of a mess. 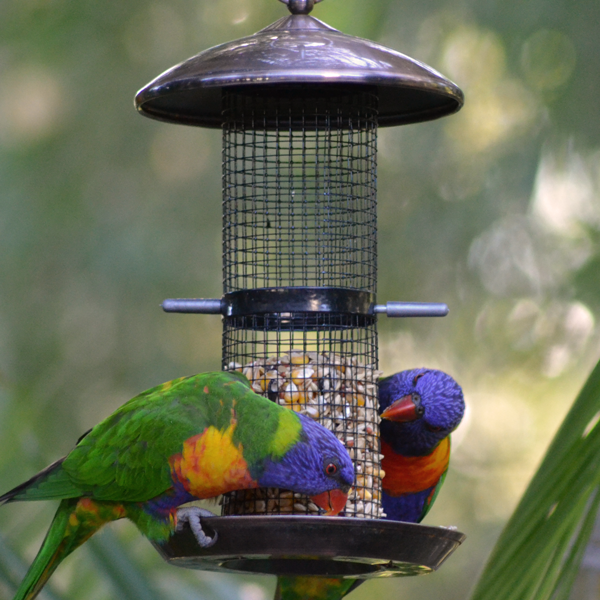 Suet and fruit feeders can attract a variety of birds, fruit attracts a lot of parrot, lorikeet and parakeet species while suet can generally attract your insect eaters such as pardalotes, robins, thornbills etc in the right setting. Both fruit and suet can go off, especially in the warmer months, and so food should be replaced as often as you can. Suet and fruit feeders should also be cleaned well with warm water and dried before rehanging, you want to ensure that no bacteria is left over. Tray or platfor m feeders come in a wide range of styles, sizes and materials. They are generally quite large feeders and attract the widest varieties of species as they can offer pretty much any type of food and don’t restrict any bird types, this includes your typical ground feeders like doves and pigeons. This means that they also encourages a lot for the larger, more predatory birds to your feeder and can chase away the smaller, more vulnerable species. Some styles include a roof or guard against the weather. They are the easiest types of feeders to refill with food as it’s simply a matter of throwing the food on to the tray or platform. Cleaning however, needs to be frequent and thorough as the tray and seed can become soiled very quickly. Use 1 part bleach with 9 parts water to disinfect the feeder and ensure the health and safety of your backyard birds. Window feeders are a great variety of bird feeder as they can offer bird enthusiasts a uniquely close-up view of backyard birds. Window feeders are usually made of clear, acrylic or plastic, held on to the window by a number of rubber suction cups. They should be affixed to the outside of a smooth window and filled with either seed or mealworms. The clear material also allows the birds to spot the food more easily but remember that it can take a while for your birds to spot the treats being offered as well as becoming brave enough and accustomed to the idea of eating so close to the window, so have patience. Don’t be concerned about window feeders being a collision risk to the birds. 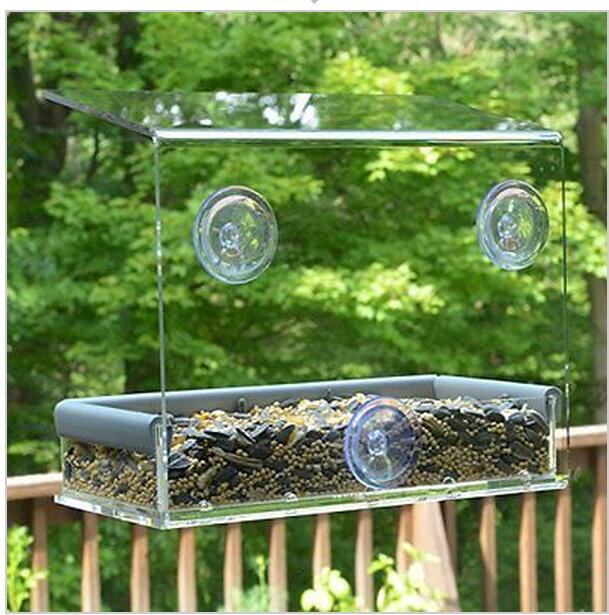 Window feeders are low risk as the feeder itself and seed provide the reference that birds need to be made aware of the window. One thing to remember is to always clean your window feeder and change your food often. Birds tend to stand in the seed when eating and can soil the food quickly. Window feeders tend to be a great feeder type for attracting the smaller species of birds, especially the insect eaters, when offering mealworms. The location of the feeder can provide some protection from the larger, more aggressive backyard birds. Window feeders are typically a great type of feeder for finches, sparrows, mannikins and even robins. We hope this provides some basic information on the types of feeders available to include in your backyard. But always try to think about creating a bird feeding environment as opposed to just offering a single bird feeder. Offer water to your birds, keep the whole area clean and ensure their safety. You’ll be rewarded with a variety of birds you never knew you had access to. We are having a garden makeover in the Sydney suburb of REDFERN. We have a small inner city garden and we want to attract native birds (small) and make a sanctuary for them. I live in Albany WA and have Silver eye honey eaters and new holland birds. My question is will they mind under cover feeders as we have a lot of rain here and I seem to waste so much of their food. Hi Jean. As with most new feeders or accessories, it may take the birds some time to grow the confidence to approach it but in our experience, they always come around. Coles sell a Wild Bird Seed Mix that is appropriate. The mixes are always a good way to start. If you notice the types of seeds left over (if any), you can adjust your seed to suit their appetite.